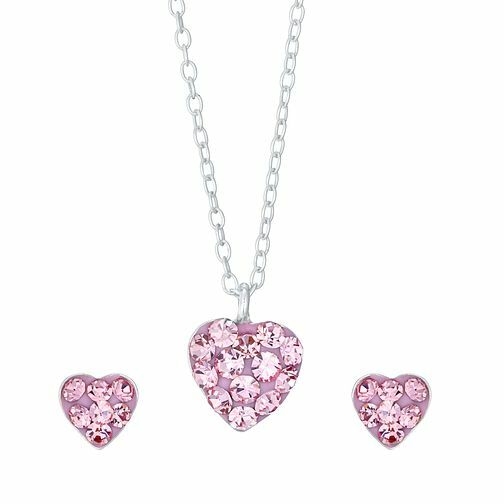 Your little one will look pretty in pink with this beautiful crystal earrings and pendant set, a perfect gift that any girl would cherish. Kids Silver Pink Crystal Earrings and Pendant Set is rated 5.0 out of 5 by 4. Rated 5 out of 5 by Anonymous from Earrings and necklace set I bought this for my nieces birthday. Very cute and she loves them. Comes in a lovely pink box. Paid for gift wrapping thinking it would also come in a gift bag as advertised but it doesn’t. Comes in a gift box.